The Dogsafe Canine First Aid 101 DVD is designed for dog owners and dog professionals and is taught by Michelle Sevigny, a former police officer and creator and head instructor of Dogsafe Canine First Aid. The DVD is professionally filmed and edited by documentary filmmaker, and Dogsafe graduate, Laurie Kindiak. The Dogsafe videos are excellent, I feel like I'm sitting in class with you! It will be an excellent resource that I can review from time to time in the future. Thank you! 3-disc DVD set. Free shipping. Mp4 digital download file. 1.13 GB in 3 segments. 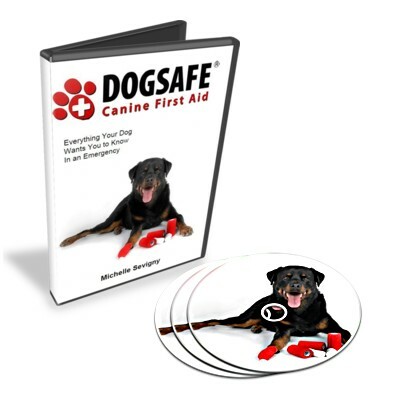 The Dogsafe Canine First Aid 201 DVD is designed for dog owners and dog professionals and is taught by Michelle Sevigny, a former police officer and creator and head instructor of Dogsafe Canine First Aid. The DVD is professionally filmed and edited by documentary filmmaker, and Dogsafe graduate, Laurie Kindiak.